Fermanagh's Josh Elliott on the Tyco BMW. Ballinamallard’s Josh Elliott will again ride for the Tyco BMW team this weekend in the Superstock 1000 class at Snetterton. Elliot was brought in as a replacement for the injured Ian Hutchinson at Knockhill, where he finished fifth in the first race. The 2015 Stock 1000 champion said: "I really enjoyed being back in with the Tyco boys at Knockhill and despite Sunday maybe not going according to plan in race two, I was pretty pleased with my pace in Saturday’s race, not having ridden for almost eight months,” Elliott said. “I have great memories from Snetterton, where I secured one of my best ever wins in the class - ironically in my championship season in 2015 - beating Alastair Seeley on the Tyco BMW after a last lap battle. I’ll be traveling to Norfolk aiming to push the Tyco BMW close to the front, where the goal will be to fight for the podium." 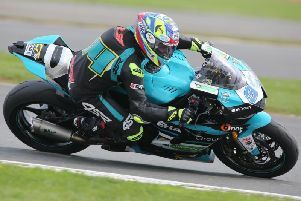 The Northern Ireland team will also run Jordanstown’s Andy Reid alongside Christian Iddon in the British Superbike class after big-name signing Davide Giugliano parted company from the team recently.